There is a strong Australian culinary identity with fish and seafood – whether in the form of fish and chips on holiday, or a family fish pie or some prawns on the BBQ – we love our fish and it is part of our everyday lives. Seafood Sustainability must therefore be about everyday seafood choices. Sustainability is not posh or highbrow it comes right down to the tinned tuna we put in our children’s lunch box. With the insatiable global appetite for seafood and the fact the human race is rapidly depleting the oceans, we face an uncertain future unless we change some of our fish eating habits. Huge stress is placed on certain species because that is what the consumer most easily recognises. 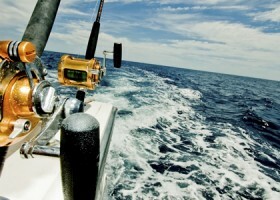 Tuna, Cod, Salmon, Snapper and Prawns are a few of the species that show up again and again. With rising prosperity across the developing world, there is a huge growing middle class, including 300 million people expected in China, not to mention Brazil and India. Once people have a new house, a car or fridge, they will automatically strive for the most affluent commodity –more protein. The problems of over fishing are only going to get worse unless we take immediate action about how we consume fish and treat our oceans. I am not telling you to not eat fish. Fish is the perfect food. Not eating it would extract you from the problem, but also remove you from being part of the solution. So what is Sustainable seafood? Well it doesn’t mean relying on farmed fish. In the process of fish farming, thousands of sterile fish are intensively reared in one cage, by being fed wild fish. To produce 1kg of farmed salmon takes at least 4kg of small fish that have been vacuumed from the ocean injected with colourings and antibiotics and made into fishmeal. That 4kg of small fish is then no longer available for wild fish to eat, or for human consumption. 40% of the global fish in the ocean is made into fishmeal to feed either fish, animals, or made into fertilizer. The role of aquaculture however is going to be increasingly important in the challenge of feeding the planet. As a method of production it cannot be ignored. What food these farmed species are fed has got to be from sustainable sources that do not deplete the ocean. Mussels and Oysters are excellent sustainable sources of protein as they have a very short food chain. These delicious shellfish do not have to be fed; instead they simply convert marine algae into themselves. Cultivated mussels are cheap, delicious and are produced with minimum impact on the marine environment. At fish & Co. , the sustainable seafood café in Annandale in Sydney we use lots of alternative species that have a high biomass. Fish such as whitebait, sardines, mackerel, bonito, leather jacket, sea mullet and Coorong yellow eye are fast growing and fast maturing. These are the ones you should be looking for at your local fish shop. You could try a black fish or a bream that is fraction of the cost of a snapper, under utilized faster growing, and a much more sustainable option. Fresh Sea mullet fillets make delicious eating and are very sustainable. These types of fish, like the mackerel are massively under used, this is largely due to their unfortunate name. They are often wrongly considered an inferior fish and one that can only be used as bait. This is unfair and really not true at all. Many people who have this opinion have never actually eaten a fresh sea mullet or a mackerel. They are great pan fried or roasted so that they have a crispy skin. Once tried, they are proving to be a popular choice for any one who comes to the restaurant. We cook sea mullet fillets in many ways at Fish & Co. The richness of the flesh works well with spices and strong flavours and needs to be balanced with salt and sourness as well. Chilli, horseradish, fennel and coriander seeds work well. You could try roasting a fillet with some dried Middle Eastern spices such as ground coriander, cumin or some Indian garam masala. Try marinating the fillets with some Charmoulah, which is a North African spice paste. The roasting of the spices on the fish adds another dimension to the dish. You are then making food that is three-dimensional, which is exciting and vibrant on the pallet. Alternatively you could use some lightly roasted ground fennel seeds. The spicy fish can be served with a vivid salad of cucumber, fresh herbs, with an oil and lemon dressing. Or try a crisp salad with slices of pink lady apple with thin slices of radish with mint, red chilli and lemon zest. The fresh acidity of the apple and the dressing cuts through the richness of the flesh of the fish. There is a complex balance of flavours and textures that makes this fish dish really exciting. Sweet fish and hot spices, sour and salty dressing sweet and sour fruit such as apple or pomegranate make for a combination that will leave you wanting more. We are one of the few restaurants in Sydney to use Albacore tuna. This is a much smaller member of the tuna family and will get to 15-20kg and breeding maturity in about 3 years as opposed to 10 years and 100kg for a large yellow or blue fin tuna. This is a much more sustainable option –choose albacore or skipjack for your next dinner party. These smaller types of tuna are often pole and line caught which is one of the most selective methods of fishing for tuna. Greenpeace has compiled a consumer guide for buying canned tuna, which is part of the Australian Marine Conservation seafood guide. This is a good tool for helping you choose the canned tuna that is fished in the most environmentally responsible manner. Some brands are very much better than others. By doing this you can make a more sustainable choice when filling your children’s lunch box. As a society, we must use more of these alternative species that are under utilized. We must demand that our wild fish comes from certified sustainable sources. It is important that we take up a position of environmental responsibility. People power can make a difference. In London after the airing of the documentary ‘The end of the line’, people protested and all of the large supermarkets changed their fish buying policies virtually overnight. 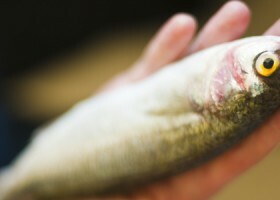 Coles and Woolworths have both pledged to source fish from sustainable sources by 2015 but it is only a fraction of the answer. What it comes down to is the tinned tuna in your lunch box and how it was caught or the fish from the canteen, whether at school, university or at work as the intern or the CEO. Vote with your mouth. Do your homework for Fish Sake, and ask your fish shop to do the same.